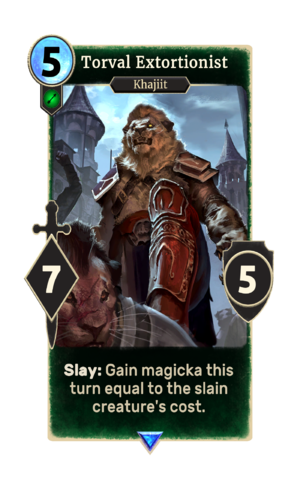 Slay: Gain magicka this turn equal to the slain creature's cost. Torval Extortionist is a rare Agility creature card. It is part of the FrostSpark Collection. "By the light of full moons you will pay!" This card depicts S'Vanir, one of the questgivers of the Daily Quests.